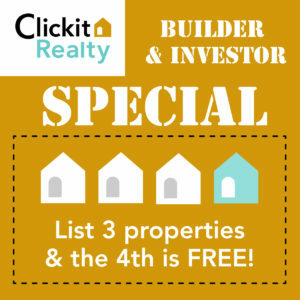 Clickit Realty does offer a builder and investor special. List 3 properties using any of our packages and receive the 4th listing free! After listing your first 3 properties, call our helpful staff and they will add the 4th package to your account. Login to the Property Management Portal and add details about your listing. This offer also applies if you are listing multiple properties at once, for instance, in a newly constructed neigborhood. Please contact our staff before adding a 4th package to your cart on our website. We look forward to serving you! If you are a builder or investor and have questions about how Clickit Realty can serve you and your business, contact our office to discuss listing packages with our experienced staff.